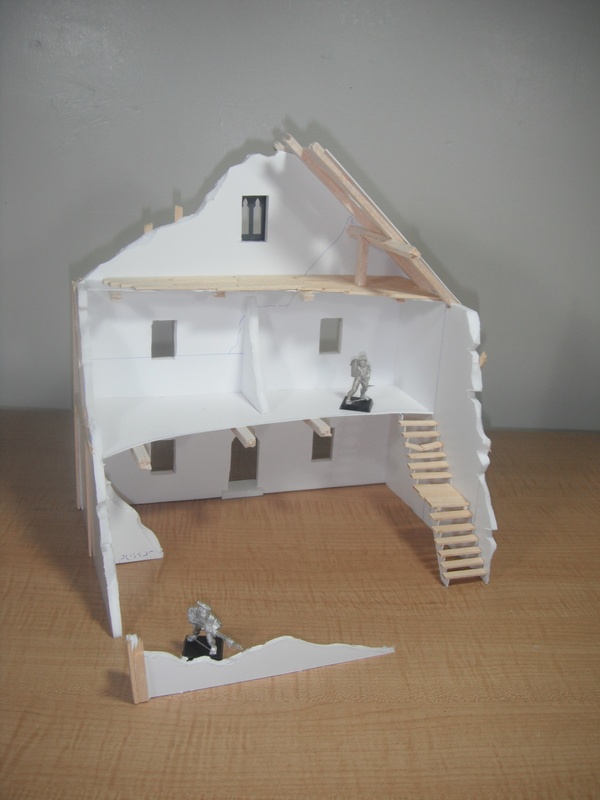 I’ve finished constructing another building for my Mordheim table. This one is a wooden house. 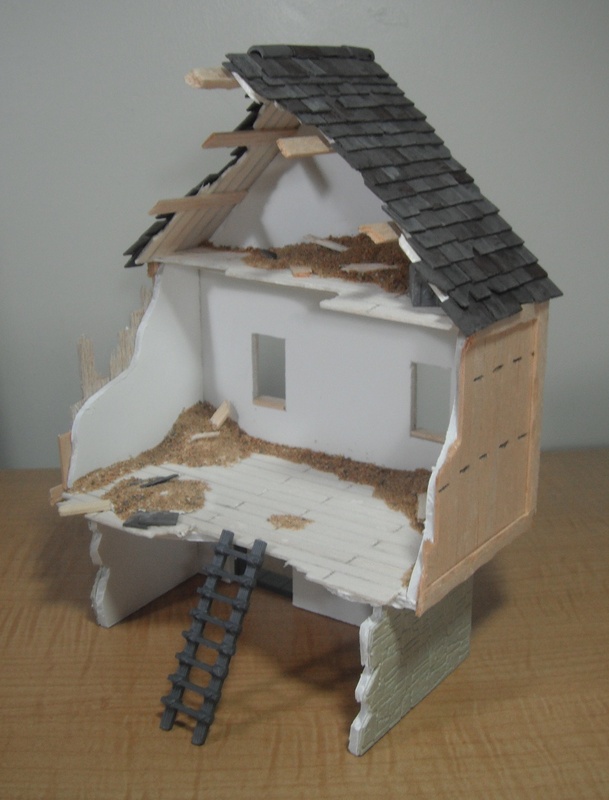 As with the other buildings the basic structure is made from foamcore which was then textured. 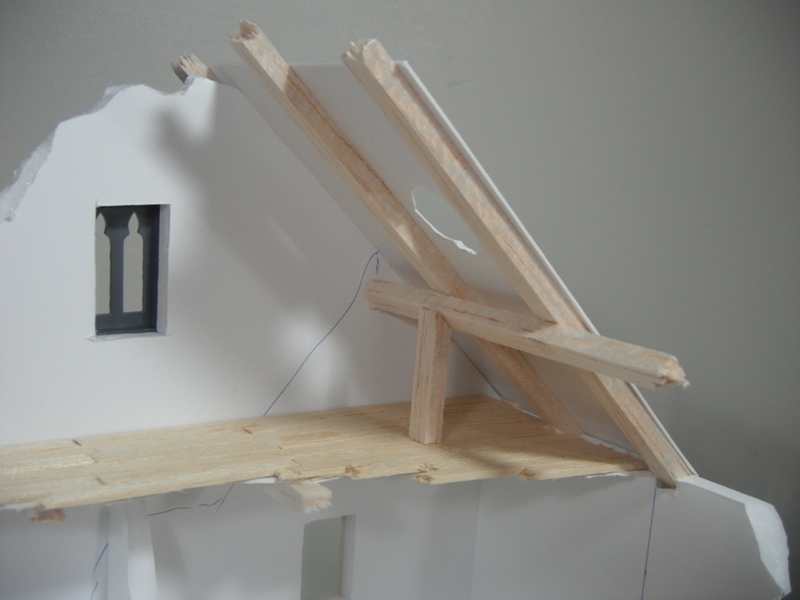 Because I was using thick plastic card and balsa wood sheets for the exterior I used 3mm foamcore rather than 5mm so that the walls would not end up too thick. I chose a more rustic looking stone (Wills Random Stone) rather than the stonework I used on the tower house as this was more in keeping with the overall look of the building. By using a variety of different materials on my buildings I hope to achieve a more realistic look to the city as real cities are not uniform and different buildings are constructed from different materials using different techniques. The interior is pretty straightforward so I won’t say much about it here. The floorboards were made from sheets of balsa wood with a pattern scored into them using a ruler and a pencil (the same technique was also used on the wooden exterior). 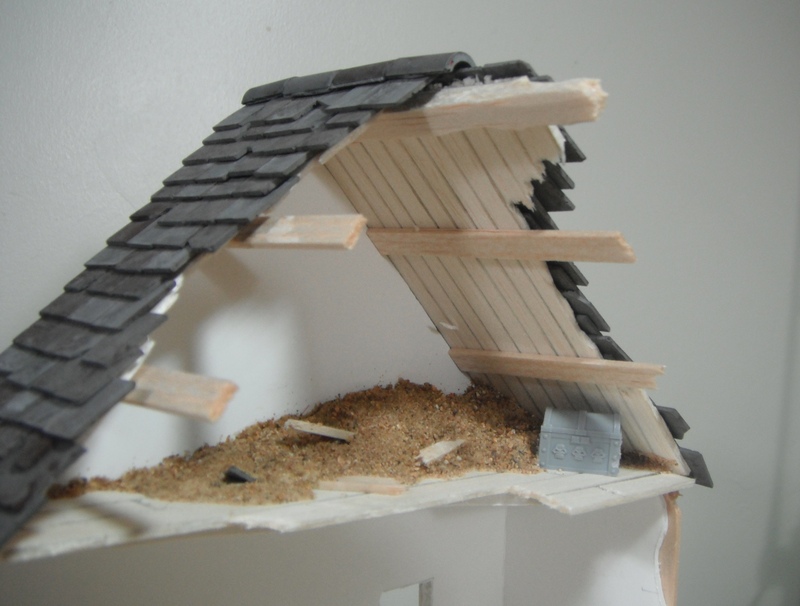 Piles of rubble were built up using offcuts of foamcore which were covered with DAS putty and then had pieces of wood and roof tiles stuck into them. When dry they were covered with sand. It’s worth saying a little about the roof tiles here. 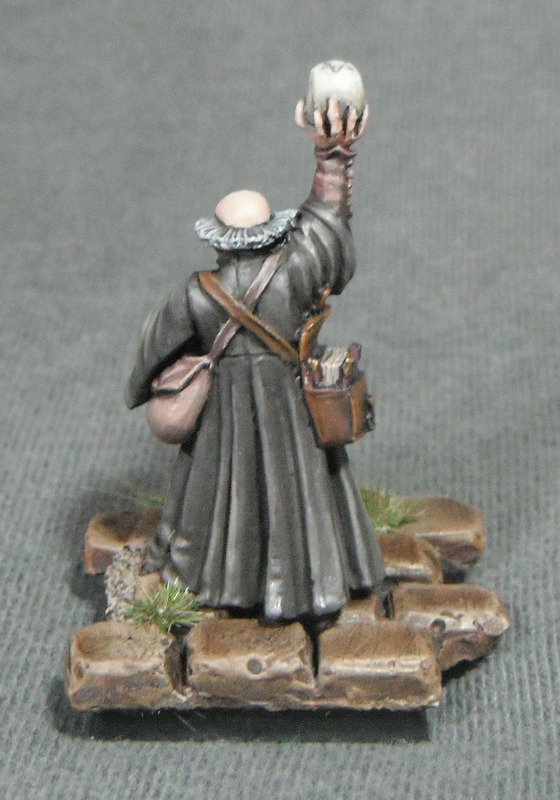 As with the cobblestones I use on my bases, these were purchased from Miniaco and were intended for dolls’ houses. The tiles are available in a variety of styles and colours and are made from reconstituted stone. I really can’t recommend these highly enough; they look very realistic and are easy to work with. They can be cut with a modelling knife or snapped with fingers. Although at first they seem a little fragile when glued down they are very sturdy. 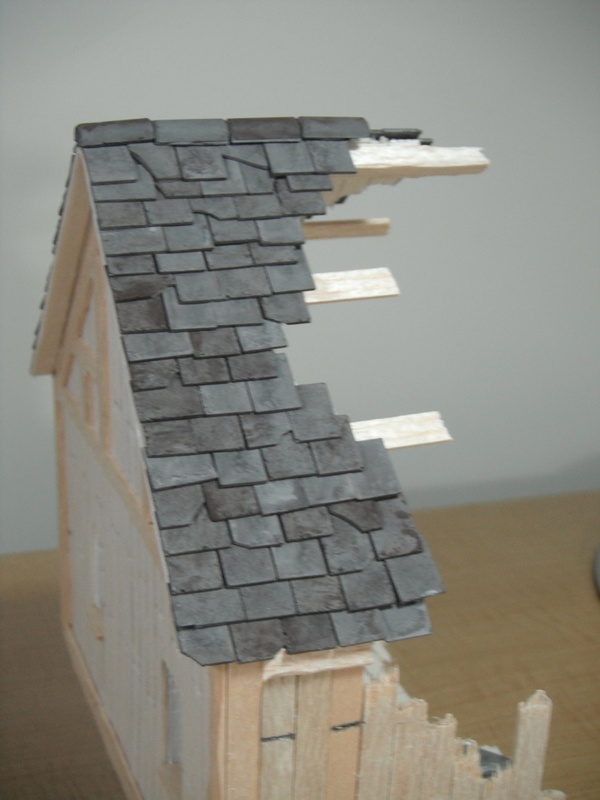 I used 1/24 scale tiles which were applied in layers starting at the bottom of the roof and working up. This was quite a time-consuming process as I had to wait for each row to dry before adding the next. There is nothing more frustrating than neatly gluing on a row of tiles only to knock them all off trying to add the next layer (as I found out by being impatient). The roof was topped off with some ridge tiles also from Miniaco. 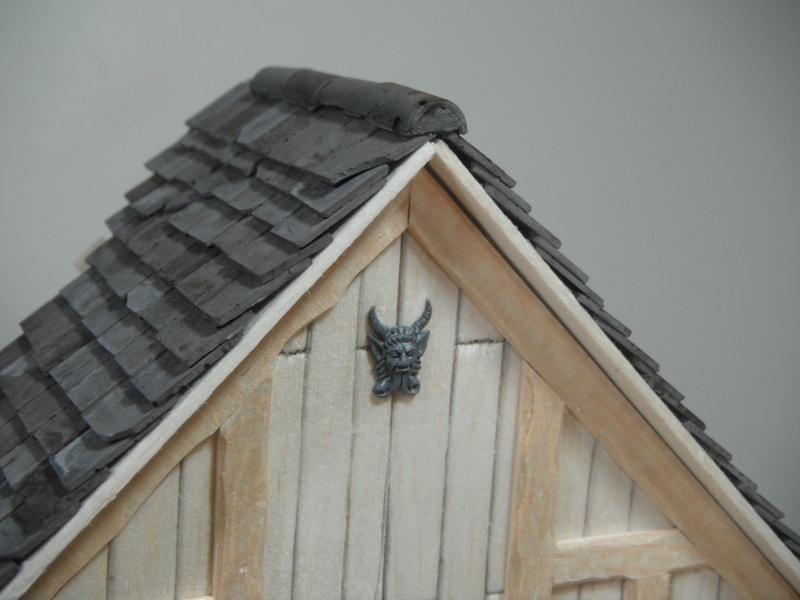 Although I intend to paint the roof, the tiles have a nice realistic look and could be left as they are. I was planning on writing a tutorial on making buildings but I got carried away and forgot to take step-by-step pictures. 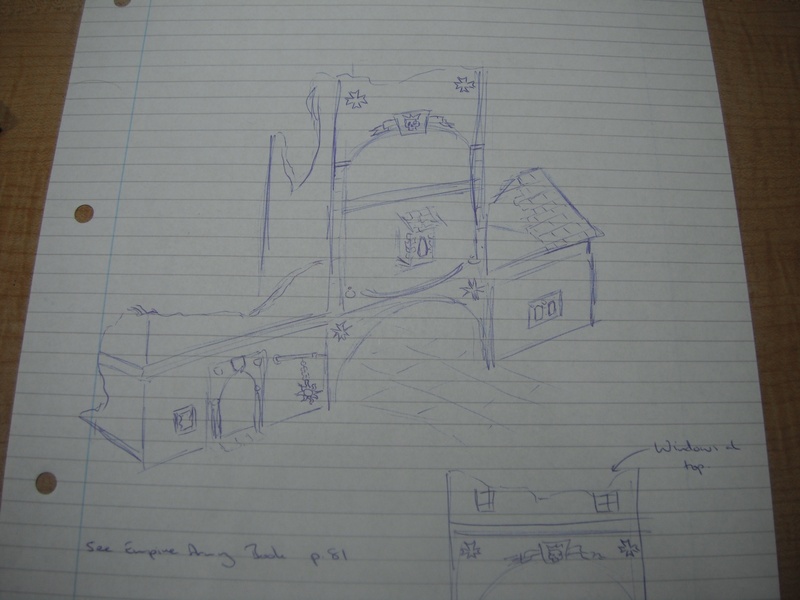 With the next building I will try to remember and write a more detailed piece on the construction of the buildings. 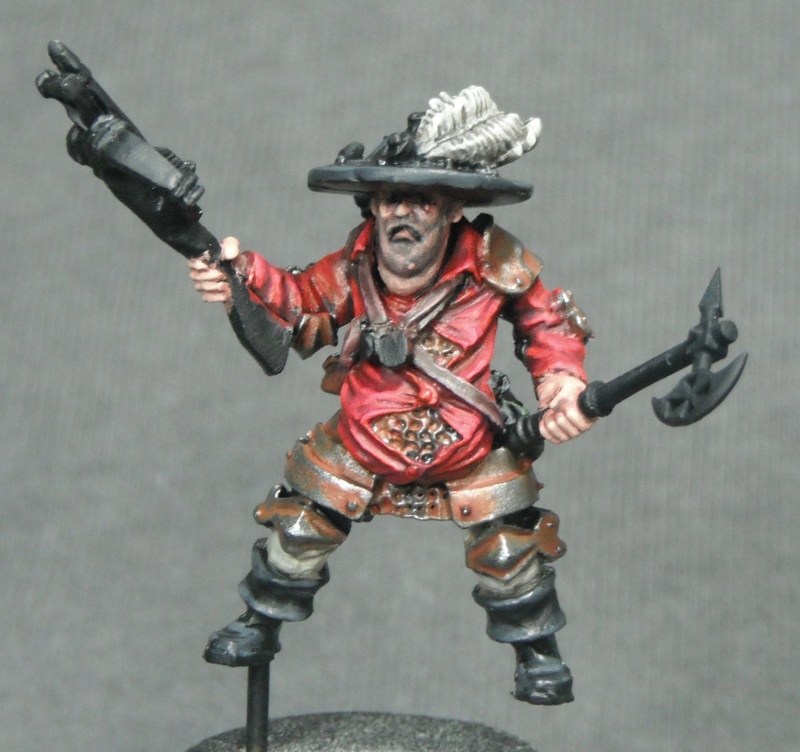 This certainly isn’t the fat man dressed in red you usually see at this time of year but my Mordheim mercenary captain. 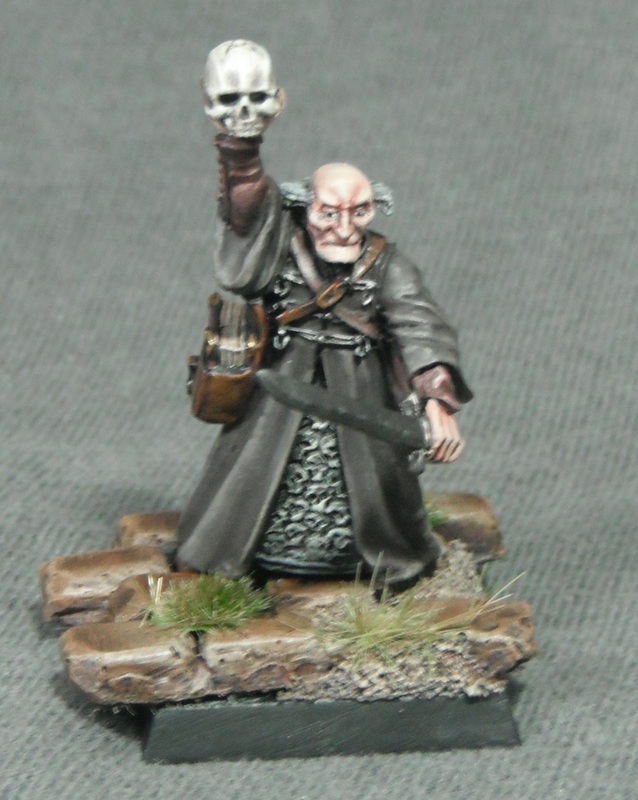 This guy is going to lead my band of Reiklanders into the City of the Damned in search of riches. I armed him with a crossbow (a characteristic weapon of Reikland) as well as a sword and an axe if things get up close and personal. 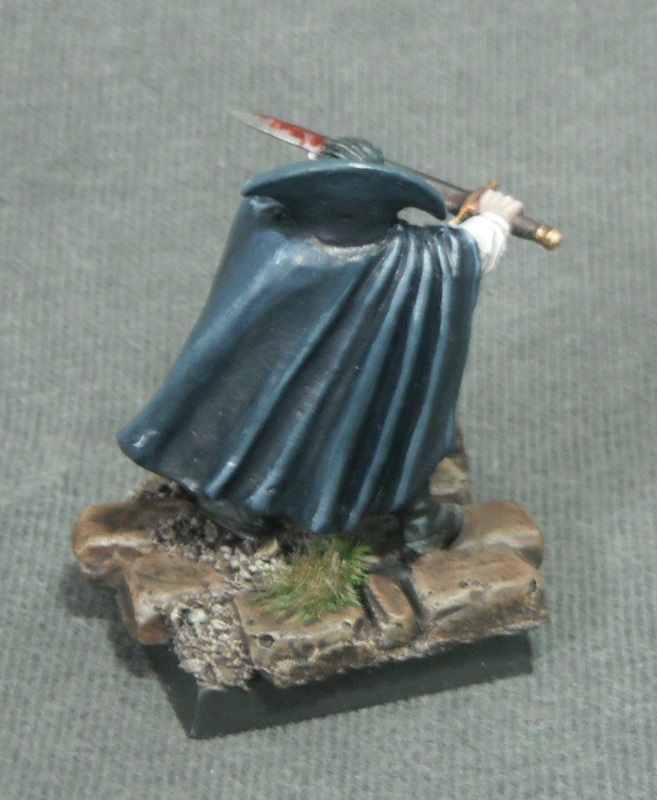 He also has heavy armour and a helmet for added survivability. 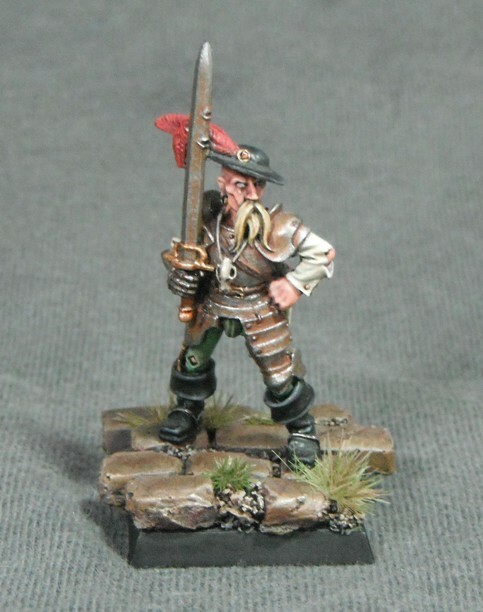 I think this is a really brilliant and characterful sculpt which is sadly overlooked in the GW range. 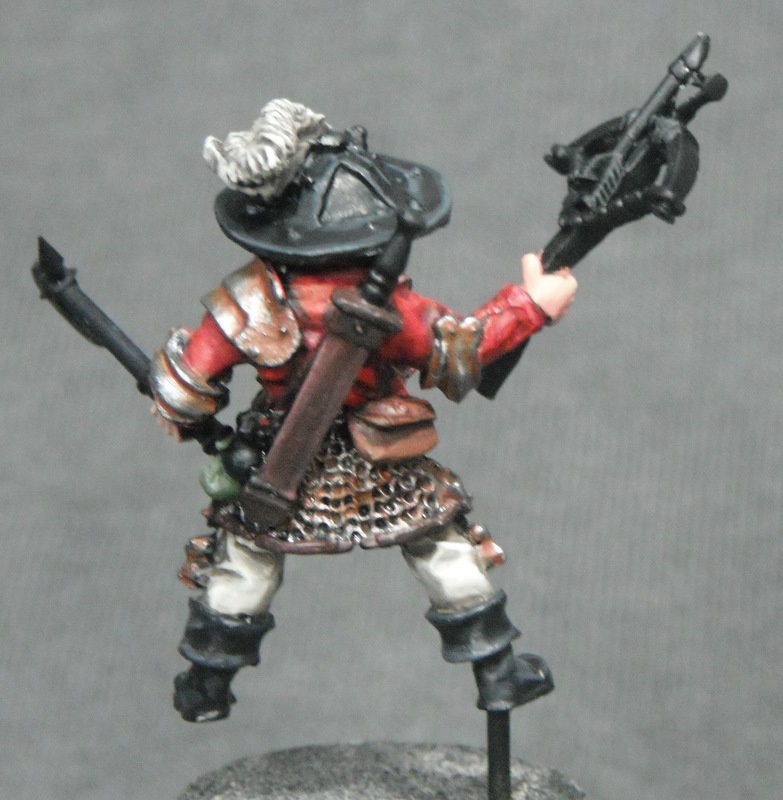 Colour wise I stuck pretty close to the painted example of the Games Workshop website. 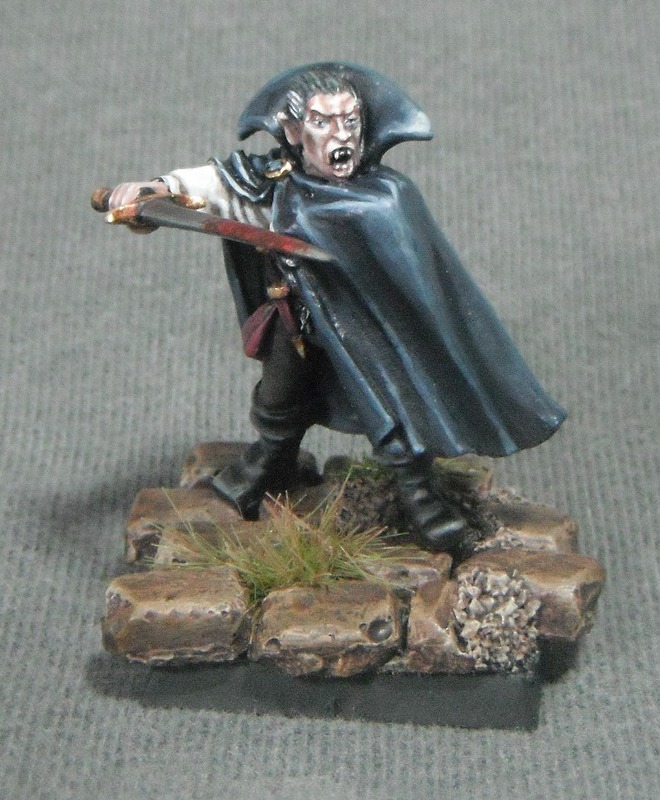 I am particularly pleased with the stubble which was painted using a mix of Dwarf Flesh, Scorched Brown, Chaos Black and Fortress Grey. 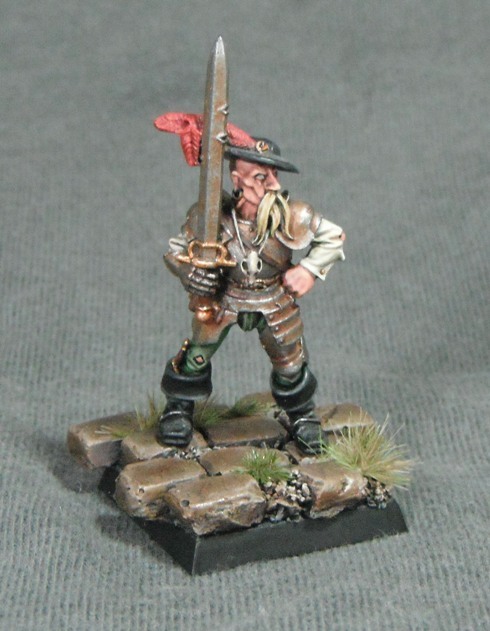 This was shaded by adding Codex Grey to the mix and highlighted using Dwarf Flesh to give the appearance that you can see his skin through the stubble. 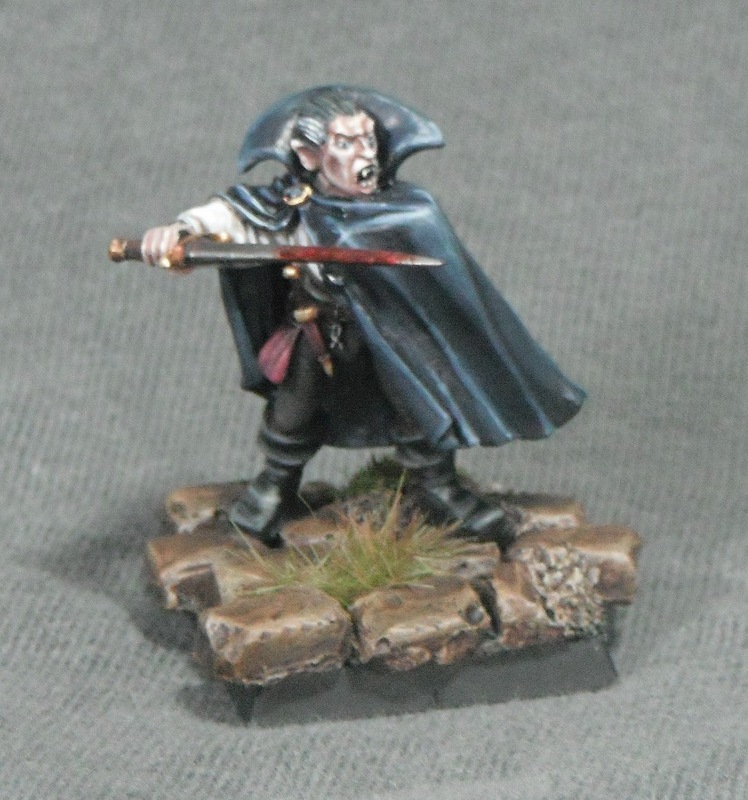 This technique was taken from the brilliant ‘Painting Faces Redux’ article from the White Dwarf archive. I would certainly recommend giving it a read as it contains some really useful advice. Following on from yesterday’s post I’ve made some more progress on the ruined tower house. 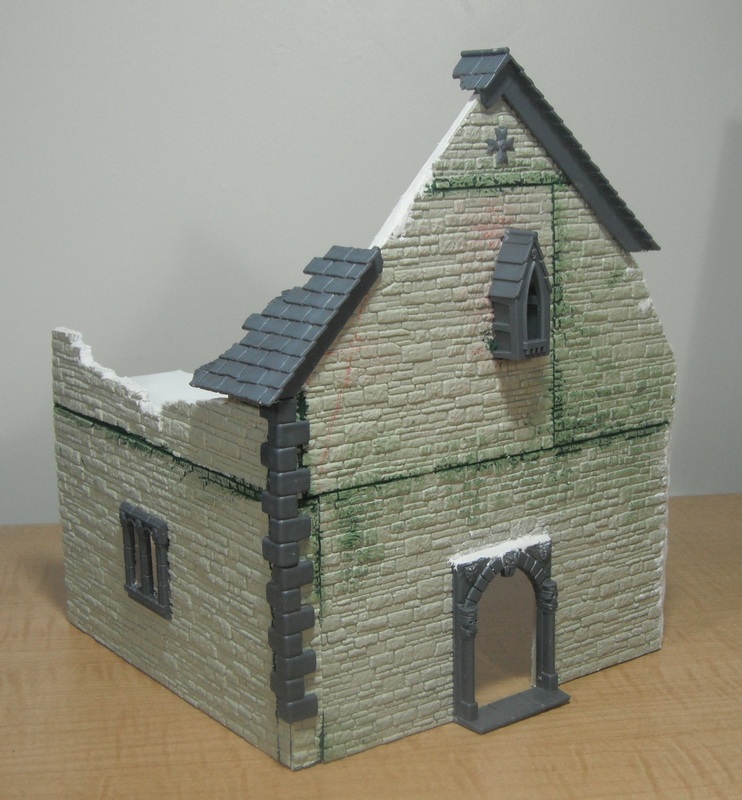 I’ve finished texturing the walls of one of the side buildings with plasticard and added some plastic details from the Mordheim building sprue. I used Wills plasticard for the walls which proved quite difficult to cut and shape. It also comes in fairly small pieces and so I had to use two three to cover a wall and then fill in the gaps. I’m not sure if there is a better way kind of plasticard to use. 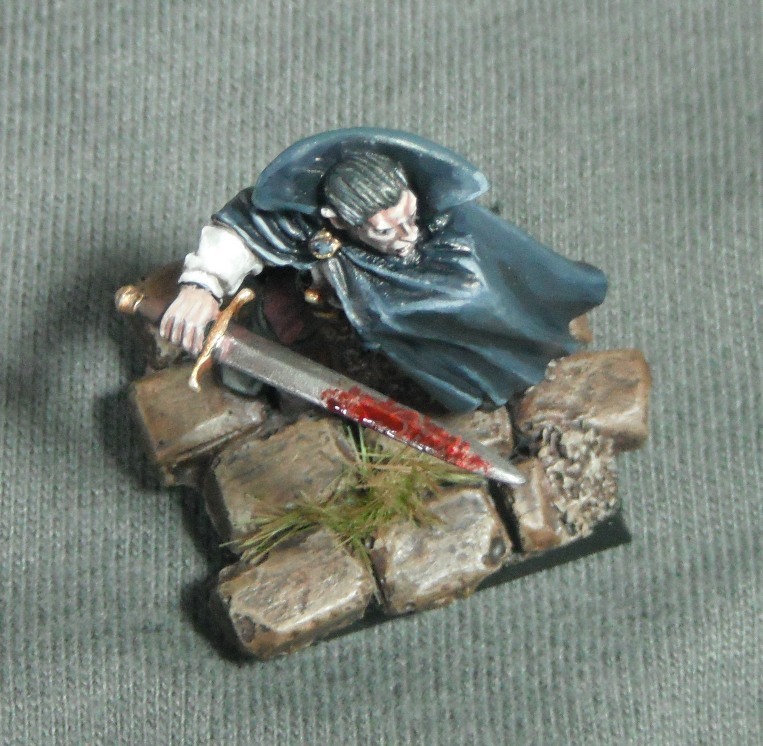 I have spent most of the last week busy with a modelling knife, steel ruler and a tub of PVA glue. 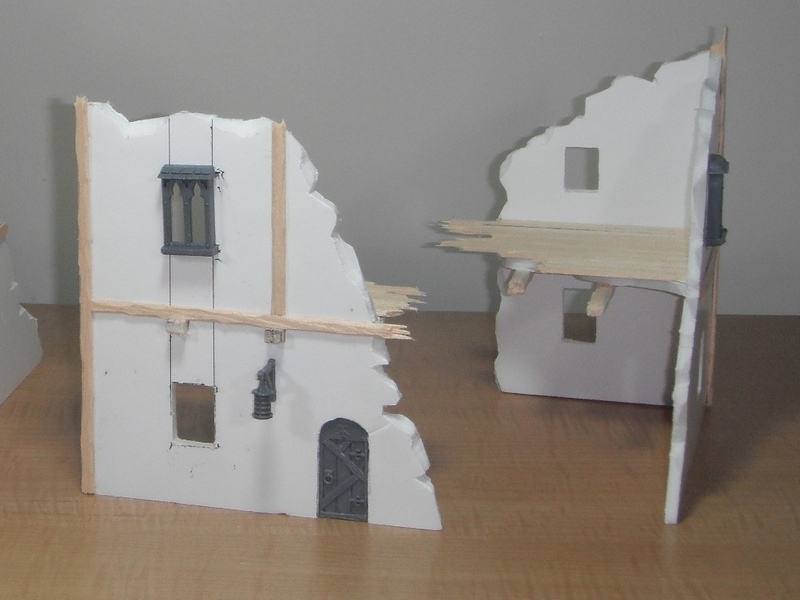 Here are the results: some ruined buildings for Mordheim. I started with the building on the right as I wanted to begin with quite a simple building before moving on to anything more complex. However, I soon got carried away and constructed the more intact building on the left. 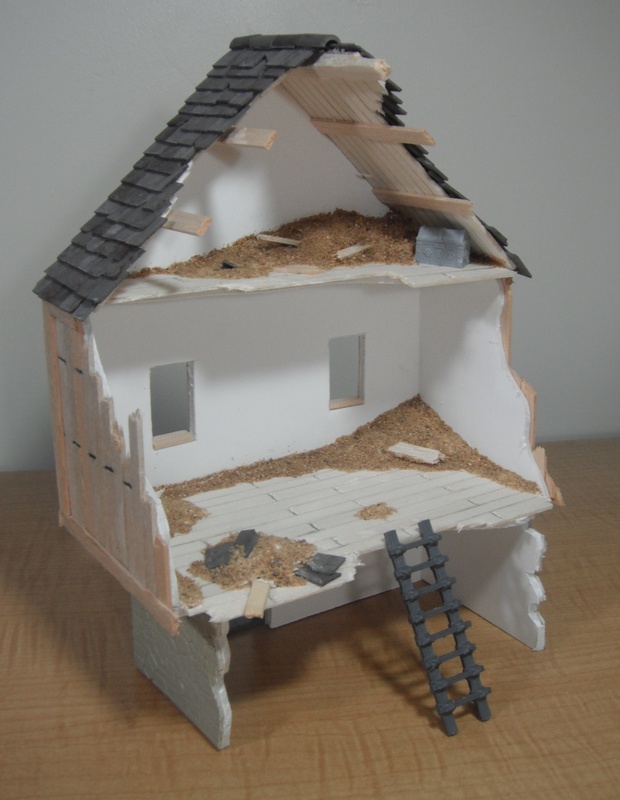 Both buildings were constructed out of foamcore which was cut to shape and then distressed with a modelling knife in order to achieve a more ruined look. As you can see, both buildings are still works in progress and still need more work. 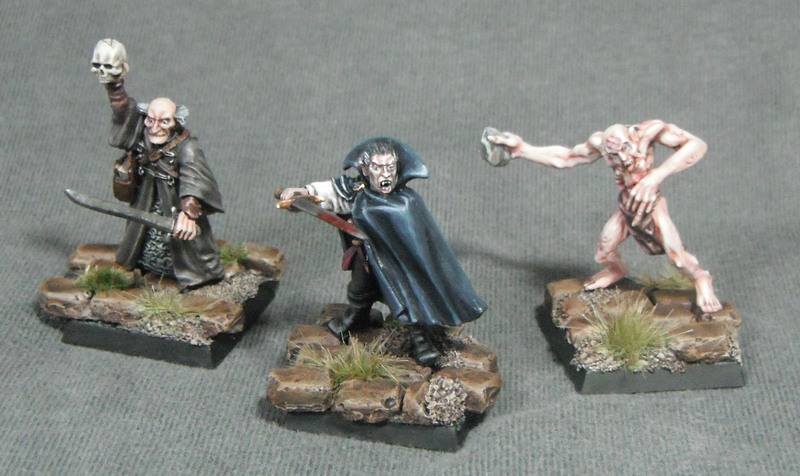 I plan on basing these and adding rubble and other details to the bases. I will also add a coat of textured paint the the exterior of the walls. 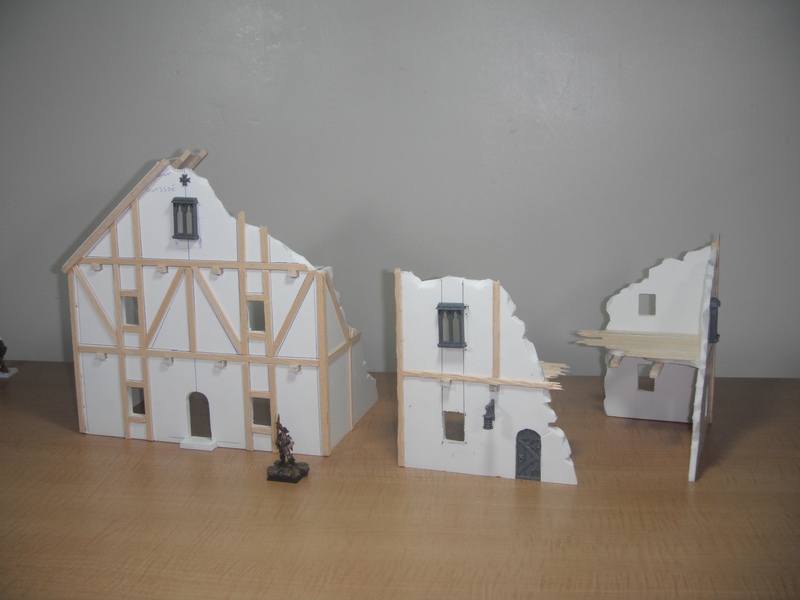 The look I went for is the half-timbered houses which are a main feature of Empire architecture. 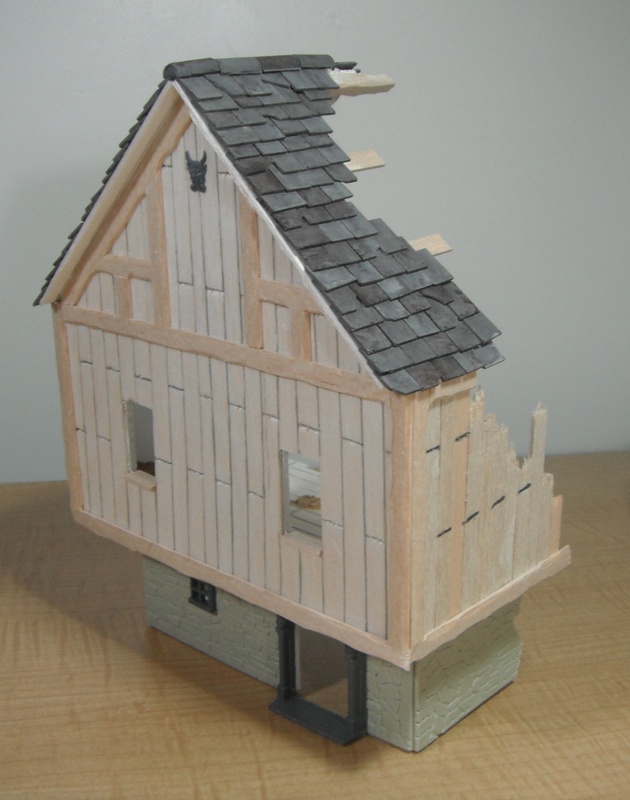 This was achieved by gluing on strips of wood purchased at a hobby shop. 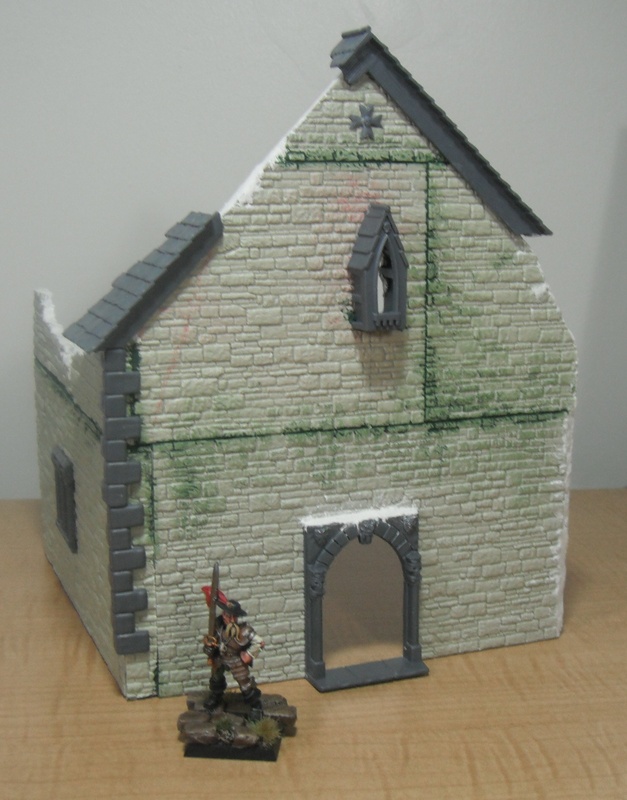 I also detailed the exteriors with some GW plastic pieces I bought online. 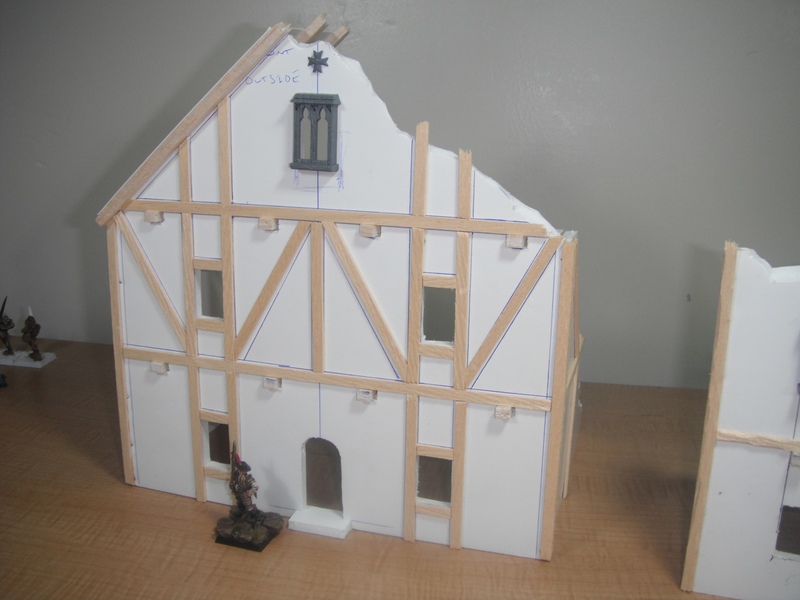 This helps tie the models in with the Warhammer Fantasy aesthetic and prevents them from simply looking like ‘historical’ buildings’. 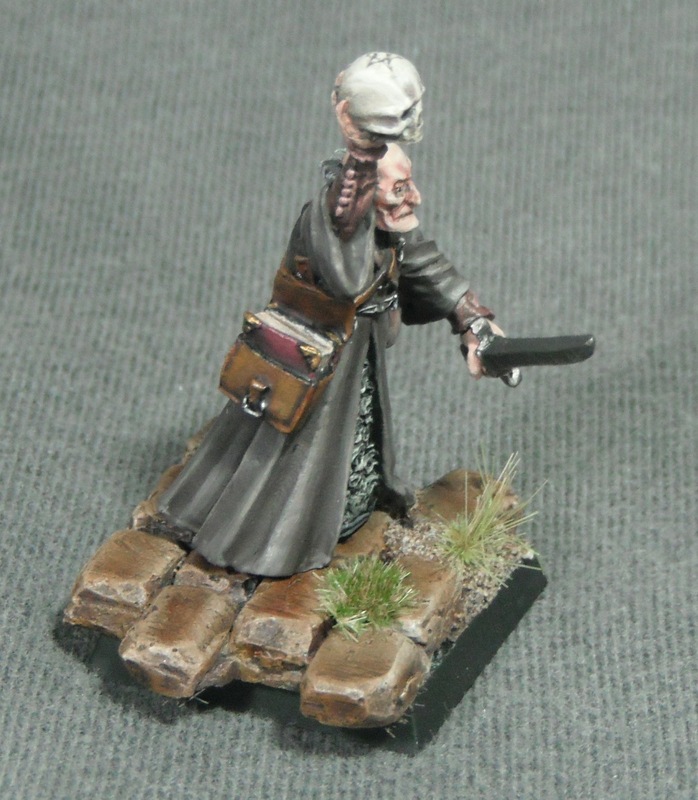 It is also a quick and easy way of adding some visual interest. With the more intact building I went one step further and added some interior detail including roof supports and a staircase in order to allow characters access to the upper floors. 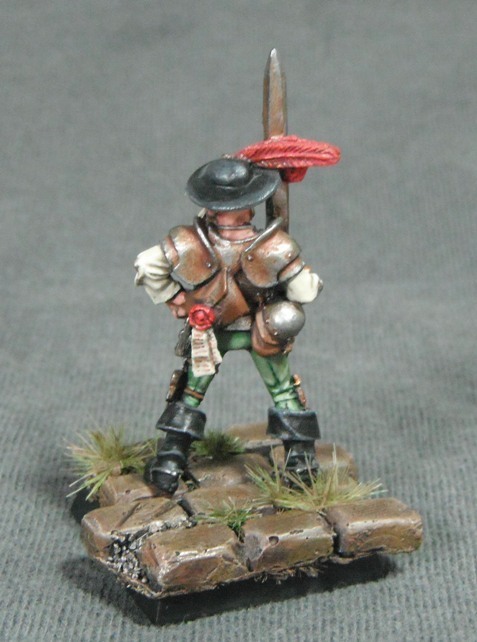 I also plan on making some ladders for the same purpose. 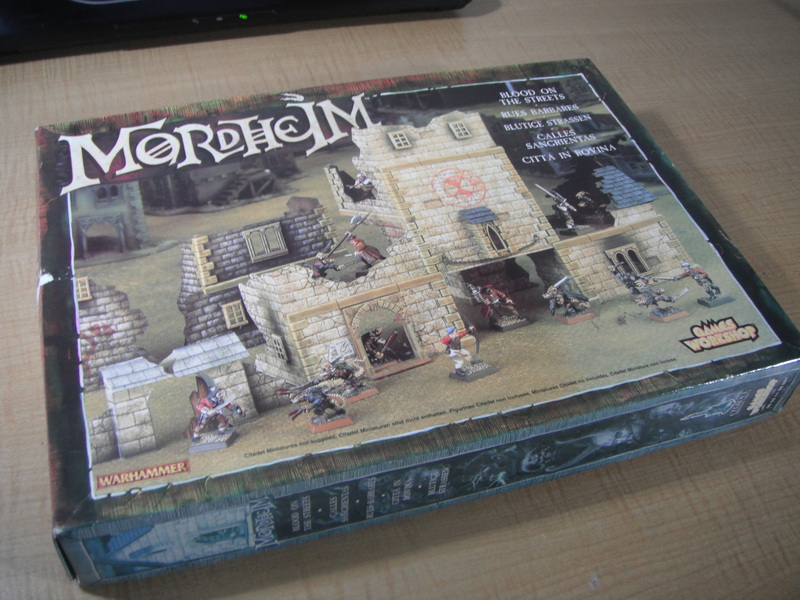 I have also purchased the Mordheim boxed game and the ‘Blood on the Streets’ building set. Although I originally received the boxed game for Christmas 1999 the buildings have since been thrown away. I am reminded of an entertaining article I read in The Telegraph about the ‘four ages of collecting’ and how one of these is buying back all of the things you collected as a kid but subsequently threw away later in life . 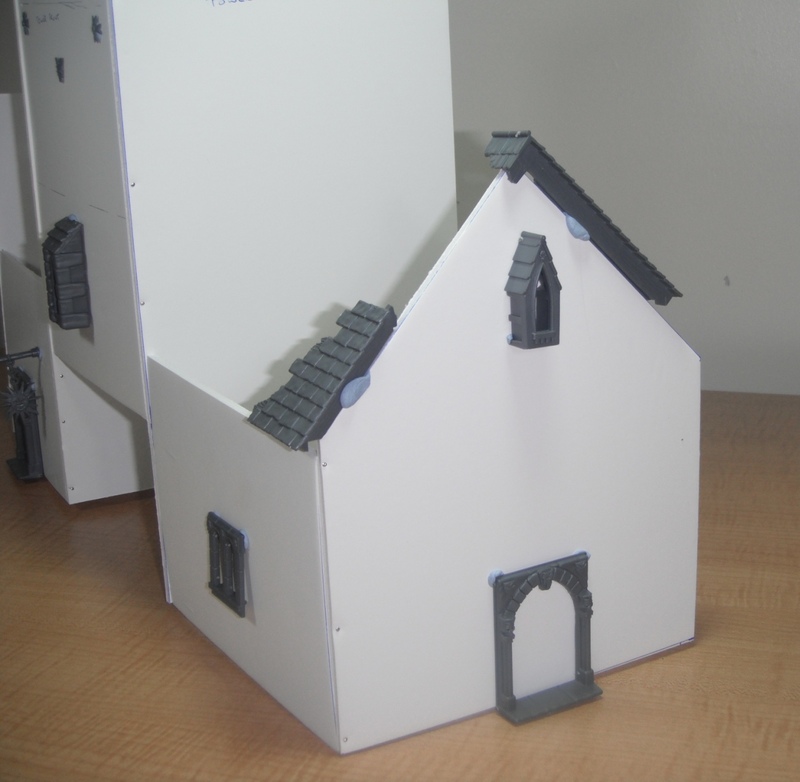 My plan is to rebuild all of the original cardstock buildings using foamcore in order to get thicker, more realistic looking walls (the card walls really are too thin). I am also going to upscale the buildings by 50% in order to fit with the scale of my own buildings. 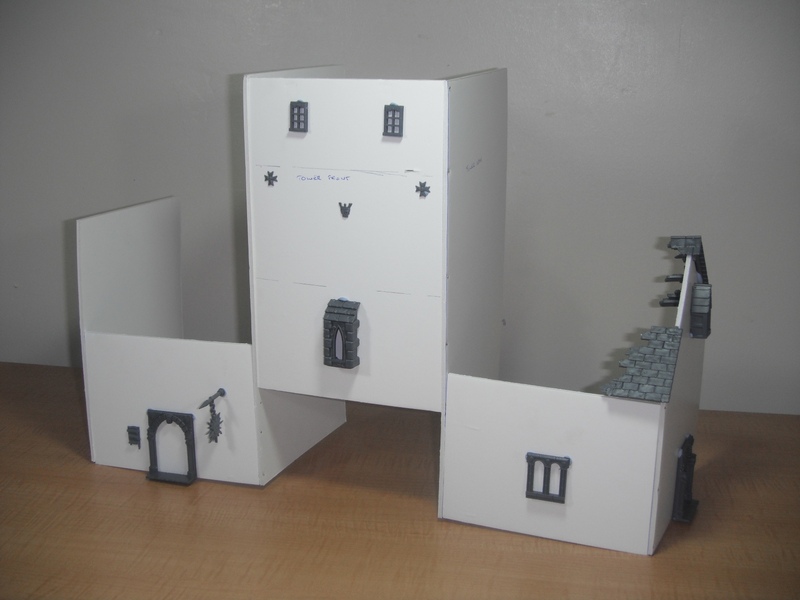 While the card buildings are great for playing straight out of the box I feel that remaking them in foamcore will look a lot better and tie them in with the scratch-built buildings.